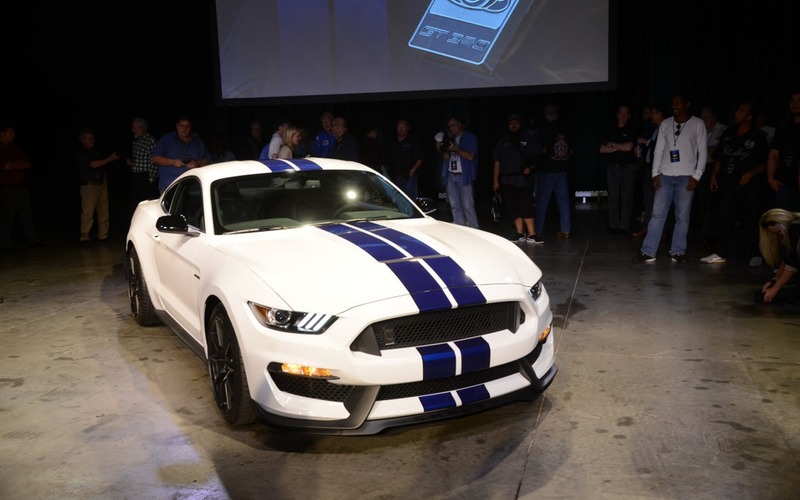 The styling is different from a regular Mustang, but Ford states that form followed function: each change was made to optimize aerodynamics and cooling. The new aluminium hood is more angular and hugs the engine, the front bumper is designed to send more air to the radiators and huge Brembo brakes, the belly pan reduces turbulence and the rear spoiler provides more downforce without significantly increasing drag. The lowered look comes from magnetic suspension on all four corners. The stylish 19-inch wheels are lightweight and shod in custom-made Michelin rubber. But the real masterpiece sits under the enlarged front fenders: to make sure the car will be able to offer the same efficiency lap after lap, Ford designed a 5.2-litre naturally-aspirated V8 with a flatplane crankshaft, which is normally found in racing cars (and Ferraris). It enables the engine to rev faster and higher, two characteristics that are useful on a track. Total power has not been announced, but Ford says that it will be over 500 horses and 400 pound-feet of torque (as a comparison, the most direct rival to this car will be the Camaro Z/28, which extracts 505 horsepower from its 7 litre V8). The engine is connected to the rear wheels via a six-speed manual transmission and a limited-slip differential. The Ford Shelby Mustang should arrive as a 2016 model. News 2015 Mustang Convertible: Just In Time For…Winter?